Pocket-size astronomical compendia were produced in Augsburg and Nuremberg, southern Germany, from the early 16th century by specialist instrument makers. This one contains the universe in a box! Provided its owner had a basic understanding of mathematics, astronomy, astrology and geography, he or she could use the various dials, tables and maps to plan journeys, predict the time of sunset in many towns in Europe (very useful when travelling), make astrological predictions, measure the heights of stars and configure the positioning of the stars for any time in the past or future. Instruments were also made as treasury items. By the 1560s, it was fashionable for wealthy gentlemen to have a sound understanding of all branches of learning, from arts and literature to mathematics and the natural sciences. This compendium was not simply a functional timepiece but also a work of art, bought for its craftsmanship and ingenuity. Astronomical compendia were housed alongside automatons, clocks and astrolabes in Scientifica, collections celebrating human ability to control nature. They were designed to impress as well as educate. 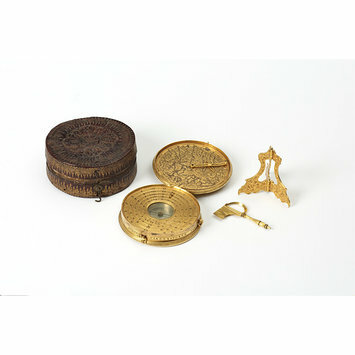 This compendium was made by one of the most celebrated scientific instrument makers of the 16th century. Christopher Schissler's workshop was famous in his own time. He supplied precision instruments of exquisite quality including globes, astrolabes, sundials, armillary spheres, astronomical compendia and surveying and drawing equipment. Schissler's clientele was international. Many of his dials are laid out for English or Italian latitudes. In 1571 Schissler travelled to the Dresden court of August I, the Elector of Saxony, in order to set up and demonstrate his instruments. He also visited in 1583 the court of Emperor Rudolf II in Prague who was well-known for his fascination with clocks. Instrument makers had to be excellent mathemeticians, artists, engravers and metalworkers. Astronomical compendium of copper-gilt with separate wind-vane and plummet stand, each compartmentalised in separate red leather case (M.165A-B-1938). Acquired by the Museum in 1938 as a gift of Mr W.E. Miller, FSA. Previous provenance unknown. Historical significance: This compendium was made by one of the most celebrated scientific instrument makers of the 16th century. Christopher Schissler's workshop was famous in his own time. He was born in around 1531 and started his workshop after 1550. 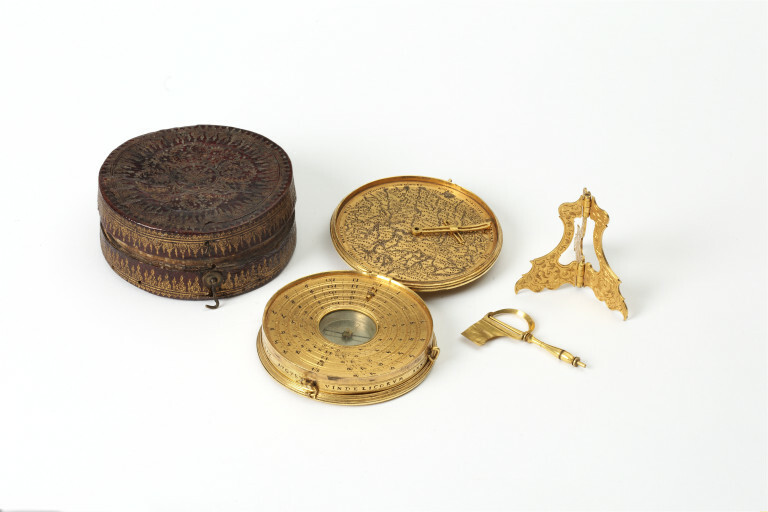 He supplied precision instruments of exquisite quality including globes, astrolabes, sundials, armillary spheres, astronomical compendia and surveying and drawing equipment. Schissler's clientele was international. Many of his dials are laid out for English or Italian latitudes. In 1571 Schissler travelled to the Dresden court of August I, the Elector of Saxony, in order to set up and demonstrate his instruments. He also visited in 1583 the court of Emperor Rudolf II in Prague who was well-known for his fascination with clocks. From 1580 Schissler produced many surveying instruments and became invloved with the survey of the town of Augsburg between 1598 and 1602. The red leather stamped and gilt case is also a rare survivor, adding to the significance of this piece. Pocket-size astronomical compendia were produced in Augsburg and Nuremberg, southern Germany, from the early 16th century by specialist instrument makers. This one contains the universe in a box! Provided its owner had a basic understanding of mathematics, astronomy, astrology and geography, he/she could use the various dials, tables and maps to plan journeys, predict the time of sunset in many towns in Europe (very useful when travelling), make astrological predictions, measure the heights of stars and configure the positioning of the stars for any time in the past or future. Specialist makers of scientific instruments catered for an increased interest in navigation, travel, geography and the workings of the universe. Such instruments were made for princes and wealthy merchants who were intending to travel. The map of inside the top leaf is of an area covering much of modern Germany and extends west as far as Brussels in Belgium, North to Lubeck, south to Lucerne in Switzerland and east to Krakow in Poland. The place names are orientated so that south is at the top of the map suggesting it may have been made for a buyer in northern Germany. Instruments were also made as treasury items. By the 1560s, it was fashionable for wealthy gentlemen to have a sound understanding of all branches of learning, from arts and literature to mathematics and the natural sciences. This compendium was not simply a functional timepiece but also a virtuoso piece, bought for its craftsmanship and ingenuity. Astronomical compendia were housed alongside automatons, clocks and astrolabes in Scientifica, collections celebrating human ability to control nature. They were designed to impress as well as educate.